Confession: I have been suffering from the pain of regret. I want to plead ignorance and say that I don’t know how it happened that we got to this point, but that would be a lie. I know exactly how it started. It started with a whole bunch of little things – we started to pack up for our move, so we got “too busy” to cook…we were “too tired” from packing and moving to run or work out…we “didn’t have time” to go grocery shopping so we didn’t have healthy food in the house…we were too lazy to put in any effort, and it was just easier to go out to eat. And now we’re suffering the consequences. What it comes down to is this: we have no discipline. What I find so funny is that it doesn’t feel like that first. You skip a workout one day, you go out to eat or sneak a candy bar another day, and it doesn’t seem to be so bad. No big deal, right? You feel fine! But as it becomes easier and easier to justify skipping workouts and going out to eat, finding your way back to good health gets harder and harder. Which leads to the pain of regret. To be perfectly blunt about it: I feel like junk. I’m sluggish. I’m tired. I feel bloated and chubby. I have a little belly that I’m not proud of. My clothes don’t fit as nice. I’m not sleeping well. And all of the sudden I’m regretting all that lack of discipline. And it hurts. 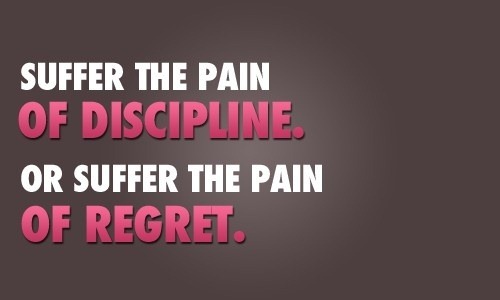 And it’s going to hurt a lot more as I slowly start to accept and embrace the pain of discipline. Running will be tough. I’m going to really, really want that candy bar. Five push-ups will feel like five hundred. But once I find that discipline again, I know how much better I feel feel and slowly it will begin to outweigh the pain of regret. I don’t want to forget the pain of regret, though, because without that memory I could see myself sliding right back to where I am now. But I want the pain of regret to push me forward, to drive me towards the pain of discipline. Posted on 8 November 2013 4 October 2015 by BeePosted in Blogging, Fitness, Running, workoutsTagged discipline, pain, regret, working out. Pingback: 2014 Whole30 | eat. write. run. repeat! 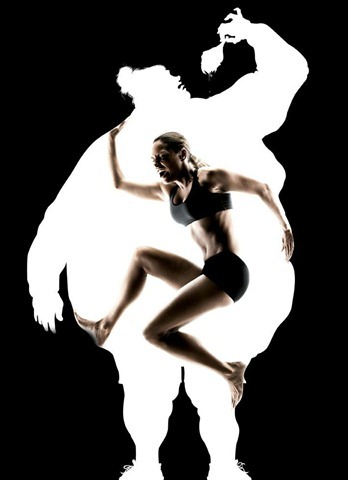 Pingback: Operation: Get Up And Move | eat. write. run. repeat! Pingback: On Blogging, Part One. | eat. write. run. repeat!